The circulation of a weekly newspaper has increased by more than 50pc since a rival title closed, its publisher has claimed. Romanes Media Group says the boost to the Reading Chronicle’s readership proves there is still an “appetite for print” following the closure of the Trinity Mirror-owned Reading Post in December. The Post, as well as its sister freesheets Get Reading and the Wokingham and Bracknell Times, was among seven titles to be closed by TM in the South of England in a move to make its operations digital-only in the area. Keith McIntyre, Romanes group publishing director, estimates the Bracknell News has also gained around 25pc more readers. Romanes has declined to release full figures as they are yet to be audited by ABC. However it has based the percentage increases on the papers’ average sales figures in the four weeks leading up to the TM titles’ closures, compared with those in the first two weeks of 2015. In the February 2014 ABC figures, the Chronicle had a circulation of 5,981 compared to the Post’s 12,389 and Get Reading’s 65,185. The Bracknell News averaged 3,098 compared to the 11,045 enjoyed by the Wokingham and Bracknell Times. 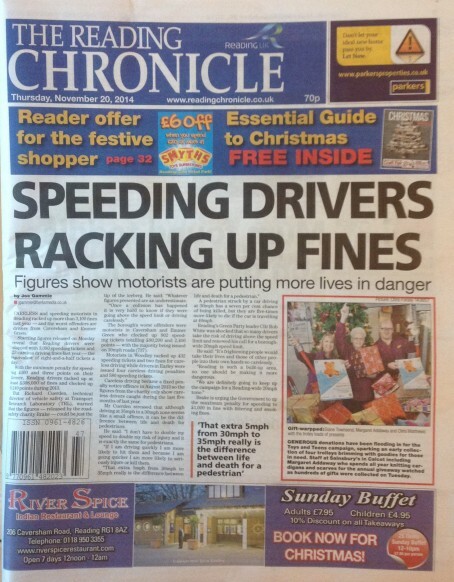 Said Keith: “It is still very early days, but it looks like around half the people who actually paid for a Reading Post have switched to the Reading Chronicle. “I think it does prove that there is still an appetite for print and we will still provide the people of Berkshire the choice of reading in print, online or both. “We are seeing a similar pattern with local advertisers, many of whom still want to see their ads in print as well as online. Keith also claimed the online audience in Reading has grown by over 30pc and by 70pc in Bracknell. He added: “We are not a print only business and both Reading and Bracknell editorial and commercial teams deserve enormous credit for raising their game and grasping the opportunity. After subbing and reporting stories such as that on the front page, I have to ask myself: Do readers really want this sort of news so prominent any more? Anyone anywhere in the country knows that you put your life in danger every time you drive on the UK’s congested roads. I am not blaming the journalists concerned because they have to meet deadlines and get the front page away, but regional papers are full of this naive kind of reporting. Weeklies in particular have so many news cliches that they are never going to take off online unless they adopt a radical new approach to what is news. Don’t ask me what the solution is because I would be out there putting it into practice if I knew. Maybe Azma, maybe. But if this gentleman’s figures are correct, the point is (more) people are buying it. Perhaps the readers aren’t so anally retentive where design is concerned? forget the awful design. This looks like a glimmer of good news for those of us who think paper might have the last laugh on digital when it comes to what matters…making significant amounts of profit and not vanity web publishing. I wish Side the Sea was running this industry. Everything would be so much better. Correct echo – most readers don’t take much notice of how their favourite paper is designed. Hmm….I’ll believe it when I see the official ABC figures. This all smacks of a bit of PR spin. And to be accurate, the February 2014 sales figure for the Reading Chronicle was 4,804 – the rest, according to the ABC certificate, were simply given away. One in the eye for the digital di*kheads!! Take note AH DIGITAL WILL NOT work for local weeklies!! Whatever the position now, it’s almost amusing that Trinity Mirror decimated the Chronicle’s circulation over many years before flogging it off, and then moved on, cancer-like, to the Reading Post, which it proceeded to kill off altogether. Trinity’s doom merchants did more that decimate it. It used to sell 30,000. Now it’s under 5,000. You do the maths. Observer50 The Reading post only sold just over 5k, with the remainder given away. Both publishers had an element of free pick up copies, the Post’s was much higher. If the figures are accurate, I am guessing that the Chronicle paid for sale has gone up by about 2,500. Surely that is good news? It’s great news to see that the people of Reading are supporting the only newspaper left, it show’s that we are a great community and want to keep our voices heard through local press. It was a real shame that the Post packed the game in, however, the Chronicle has kept local news alive for many years. Keep up the good work Chronicle. “side the sea does have a point.” The old weekly paper routine stuff, of crash deaths and their inevitable “tributes were paid this week to..”.cliches, crime, court, planning yawns and charity appeals just don’t cut it so much now. Web needs vitality and personal stories. But all the same can’t knock a few extra readers in these dire times. I like Mr Angry2’s alliterative ‘digital di*kheads’. Here are a few more. Digital … dictators, dunces, donuts, dolts, dunderheads, deceivers, dimwits. Anyone got any more? That is a rather weak lead story and I would have thought there are better tales to be splashed from the newsy Reading area. That’s if the paper has enough competent staff to go looking for good stuff. Mr Angry2 and Mr T, I don’t quite understand your logic of it being ‘one in the eye for digital’. Of the 12,389 people who used to buy the Post, it is claimed that around 3,000 of them now buy the Chronicle instead. So, where have the other 9,389 gone? I wonder if most of them have gone to that new-fangled web thing? You know, the same place where more and more advertisers are wanting to spend their money because they’re starting to realise that it’s where more and more of their audience has moved to. You’re right about digital not working for local weeklies. Print cannot compete in the long run so the paid-for model will have to go, making way for a digital option where people can get local news whenever it suits them. If you seriously think that any investment in print will reverse the now decades of decline, you are incredibly deluded. Paid-for printed weeklies have a finite lifespan. Some will outlast others but publishers who do not invest in digital properly now, at the same time as diversifying into niche printed publications, will disappear! I’m not saying print is dead, I’m just saying that the current standard model cannot possibly last without serious changes at the same time as embracing digital. Sorry, it’s not a glimmer of hope, it’s still a tiny percentage of the local population buying it and they just want to see what it’s like. Print is dying, people, get used to it and adapt quickly. So there were 12,000 people who bought the Post, and 5,000 who bought the Chronicle and the editor of the Chronicle reckoned that in Reading people bought one or the other. So a 50% lift means 2,500 out of 12,000 have moved across to the Chronicle. What about the other 80% of the Post’s readers? If I was the Reading Chronicle, I’d be asking what is putting people who clearly like reading a newspaper off from buying the Chronicle. There are easy wins, and then there are hard-fought wins. The Chronicle’s sales lift falls into the latter. The ABCs will be very interesting. Blimey. what a contrast of comments. Oliver is nearest the truth. Weeklies will never crack big money on websites, Their hit levels might be soaring but in real world terms they are a very poor attraction for advertisers. Digital income might well overtake print, but only because publishers continue to kill off print with under-staffing, poor quality and price increases. Then bosses will say: “The public didn’t want papers”. They do, but not that is on offer now. Papercide I call it. Call in the c ops. People on here seem to be getting confused. The Reading Post never sold 12,000 copies, it only sold around 5,500, the rest were simply dumped around town to either blow away or be picked up. They had virtually no value for advertisers. The Reading Chronicle gave (gives?) away just over 1,000 with the remaining 4,500- 5,000 sold. If they have increased their sale by around 2,500 I think they are entitled to be quite pleased, especially if advertisers are following readers to their newspaper. I guess it is because they know people pay for it so therefore read it. But surely never in a million years will they do that for mostly humdrum material of weeklies (crashes, cops, planning “rows”). Must go, web space to fill! !